A clean environment supports a healthy lifestyle and to have rubbish cleaned out from your area, at least around your home or business, is extremely important. Why is that so? Customer impressions and hygiene are big factors to the operations of any enterprise. 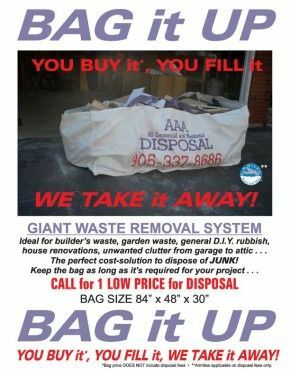 When you get a professional garbage removal service in Oakville to take care of your waste in an effective way, the litter, garbage and junk that you throw away don’t contribute to the degradation of the environment. What’s more, some of it even gets recycled to be utilized for other purposes. The electronic devices that you use are quite helpful for your daily purposes but contain harmful material like lead that can cause serious problems to the environment around you. Only professionals from certified garbage removal companies in Oakville can handle these with the caution necessary. When your garbage is out there on the road and mixes with polluted air or water, a reaction occurs that produces gases such as methane or carbon dioxide. These are quite toxic in large quantities and affects a person’s breathing. Along with odour, you will also have to contend with diseases such as diarrhea. Notice: Purchases of bags for pick-up are ONLY available in the city areas of Oakville, Burlington and Milton. Contact AAA to learn more about our services. Book your waste bin rental.